At right is a diagram of our Fleck 5600 Softener. It shows how our softener — and everyone else's softener — works. 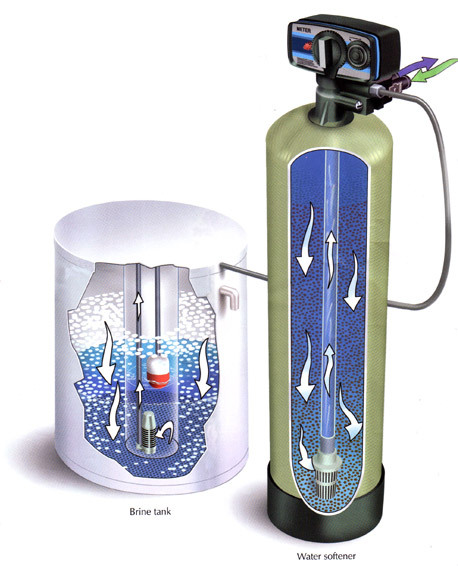 A water softener is an ion exchanger. Hard water — water with a high calcium/magnesium content — enters the softener through the “In” port indicated by the green arrow. It passes through the control valve and into the tank, where it goes from top to bottom through a specially prepared resin that “softens” it. The resin consists of beads that have been specially manufactured to be saturated with sodium ions. “Softening” occurs as the hardness minerals in the water attach themselves to the resin and are “exchanged” for sodium. The softened water then enters the long center tube, called a riser, via the strainer basket in the bottom of the tank and passes upward through the riser. The water exits the softener via the control valve (blue arrow) and is sent to the home. When the resin becomes saturated by hardness minerals, the softener automatically goes into regeneration. (The regeneration process is initiated by a timer or a meter, depending on the type of softener you purchase.) By this process the hardness minerals are washed down the drain (via a drain tube not shown in the diagram), and the resin bed is rinsed, resettled, and recharged with sodium. It is now again ready to soften your water. The regeneration process is accomplished by passing very salty water from the brine tank through the resin. Brine. Name given the extremely salty water that is used to regenerate the softener’s resin. Grain. A standard measure of hardness. A “grain” of hardness is the equivalent of 17.1 parts per million. Hard Water. Though not all authorities agree on a precise definition, water with over 7 grains of hardness is considered “hard” by almost everyone. Many would say that hardness begins at a lower number. Ion Exchange. A chemical reaction in which ions are exchanged in solution. In the case of the water softener, which is a cation exchanger, calcium and magnesium are exchanged for sodium. Regeneration. The process by which an ion exchanger (like a water softener) renews its ability to do its job. In the case of the softener, a strong brine solution is passed through the resin bed and sodium is exchanged for calcium and magnesium.